Leading a virtual team is a little like dancing with your eyes shut. You can’t see what is going on so there is a higher risk of you treading on someone’s toe. You can think you are in an amazing group rendition of the Macarena, when actually everyone else has sloped off to the bar and you are out there on your own. You have to be led, to a large extent, by what you can hear. In many ways, wherever your team may be, normal leadership rules apply. You need to listen, communicate, support, coach, empower, empathise, celebrate successes and find opportunities to make it fun. However, I do think you need to be more intentional with all of the above. It can feel like you are managing with one less sense. You don’t have the luxury of picking up on the atmosphere in an office, the vibe between different team members or the body language of someone that is having a bad day. And that can make developing an amazing team a little more challenging. I have managed and been managed remotely for many years. In my last role, at one time I had 18 direct reports (yes, that was crazy) scattered all across the globe. It is the way of the world now. And it will continue to become more of the norm. Businesses want to hire the best people – and they might not be in commutable distance of the office. Very often they are not even in the same country. And with modern technology, they don’t have to be. Employees are becoming more focused on better ways to integrate their work and life. Losing the commute and working to a more flexible structure ticks a lot of those boxes. So even if you do not manage a virtual team now, it could very well be part of your future. Most of your communication will probably be by phone. That first question – ‘How are things going?’ is the most important one you ask. Listen really hard to the answer. It is not always what is said, but how it is said. Listen for the intonation, the tone, for the involuntary sigh, for the hesitation. Any sign of these, pause at this point. Drill down further. Be ready to push aside your original agenda. Getting to the bottom of what you hear could be way more important. This is particularly important if your remote workers are home based. A tough day with no one to grab a coffee with to pick yourself up can be a lonely place. Don’t multi task while you on the phone with them. It is tempting because no one can see you, right? But they can hear you. The mute button might disguise the tip tapping on the keyboard, but you know as well as I do how easy it is to recognise when someone is not 100% present. You have to let your team members get on with it. They know what they need to deliver. When they stop delivering on time, to the quality you expect, then it is time to have a conversation about it. Until that happens let them do their thing. Making sure they are online at 9am and don’t log off till after 5pm does not make your team work hard. Supporting them in what they have to do, helping them understand the bigger picture will. 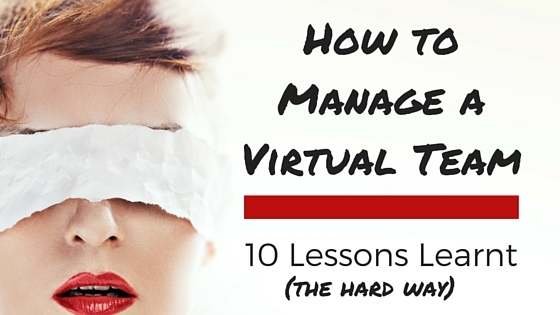 In a lot of cases, they won’t just have a virtual boss, but also virtual team members. Find ways to build a team spirit. When there are projects to be completed pair up team members from different locations so they can get to know each other. Encourage team members to call each other just to get to know each other better. Find ways for team members to share something about the person outside of work in the team meetings. ‘What you didn’t know about me’ conversations are good. When you hear banter between colleagues who have never met each other, you know you are on the right track. These are your eyes and ears. When a bad day turns into a bad few weeks, you are in serious danger of losing your team member and you will know nothing about it. I personally tried to do these weekly. And when I had 18 direct reports it was a huge chunk of my week, but probably the most important meetings I had. Of course, this didn’t always go to plan and sometimes I just couldn’t fit them all in. But I always tried to reschedule rather than cancel completely. Encourage your team members to save anything that isn’t urgent until these meetings. That will free up a little time for you throughout the week. Still not sure 1:1s are worth the time? This great article from Jason Evanish gives you 21 reasons that might change your mind. If your team aren’t based in one of the main offices, it can be easy to miss out on news about company plans. Schedule a part of your team meetings to share any updates. It is really important to have that feeling that you are all up to something together. That what you are doing, no matter where you are located, is part of a bigger plan. We have all seen the email chains that should have been diverted early in the flow with a phone call. You don’t know the mood of the recipient, or what type of day he is having. Therefore, you don’t know how that plain text on a white screen will be interpreted. Equally, you are less likely to think about your mood, and the impact that may have on others, when you are communicating via a keyboard rather than via the spoken word. For me, it was the virtual equivalent of taking over a cup of tea when a team member is stressed or a high five when something has gone well. If you are having your 1:1s with your team, you will know what they are excited about this week, and what they are dreading. A quick message at the right time can make all the difference. And in a small way, it replaces the ability to wander over to someone’s desk to ask a quick question. Watch out for the ‘everything’s fine’ team member. Probe a bit deeper. In an office environment, you might notice any frustrations or struggles or overhear the odd conversation that may trigger some concern. If your virtual team member is trying to cover over the cracks, you might not spot disaster looming. And even if the end of the world is not, in fact, around the corner, what sort of word is ‘fine’? It says to me things are bearable at best. I’d rather have to deal with a ‘disastrous’ than a ‘fine’. Is ‘fine’ going to take your business to the next level? I don’t think so. You have to be more obvious in your communication. Be more direct with your instruction. In conference calls you can’t assign tasks by making eye contact. Make sure everyone is clear on what needs to be done and who is going to do it. My biggest frustration with having a virtual team? I couldn’t take them out for beers. Or sit around and share a big tray of doughnuts with them. At the end of a really good day, or indeed a truly atrocious one, it is great to be able to do something (no matter how small) as a team. With a virtual team, you have to be a little more creative. Share the big successes with the wider organisation. A business that is physically dispersed doesn’t always hear about the great stuff other teams are doing. On an individual basis, use good old fashioned post to send them a thank you – a small gift, a card, a thank you note. Find out what they like and try and make it personal. So can you have a great virtual team? 100% yes. If you have great people, it doesn’t matter how far away they are from you. In an ideal world, I would have loved to be in the same location as all my team. Even if it was just for one day a month. For me, it doesn’t matter how swanky technology gets, you will never beat face to face interaction. However, you can build incredible teams even if you never meet them. It is harder work but I would still rather work with the amazing teams I had spread over thousands of miles than an average one in the same office. To build and nurture great virtual teams, take the key leadership skills and double the intensity. Then you will never be alone on the dance floor. Struggling To Attract Great Candidates? This Could Be Why…..